Please note I am not an insurance agent or broker. This post is to provide basic information only. Many Canadians believe their healthcare system is universal, but it is actually not exactly true. It would be more accurate to say it is compulsory, i.e. everyone has to register by law for coverage. In Canada, healthcare administration is a provincial responsibility, not a federal one, meaning there is no unique and unified system.Each province has its own program. While most Canadians are aware their healthcare system does not work abroad, very few are aware that it also does not work in another province….technically. Should you require medical assistance while in another province, you will only be covered at the rates in your province of origin. If the costs of another province are higher, you will have to pay for the difference out of your own pocket. 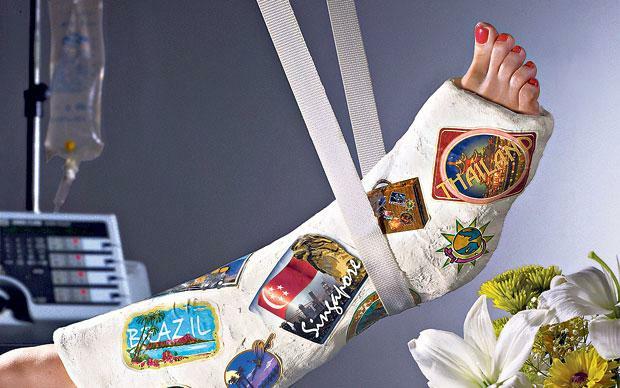 That’s why it is always a good idea to buy travel insurance if you are going away, even for a few days. your travel agent is not an insurance specialist, buy from an independant broker instead. Travel agents are usually not licensed to sell insurance. They will push for you to buy from them as they most likely receive a commission. They are not knowledgable enough to answer your questions, and you could end-up with insufficient or inadequate coverage. A few years ago, a story about a pregnant woman who gave birth in Hawaii made headlines in Canada. The couple had purchased travel insurance but the insurer denied their claim, based on a pre-exisiting condition and the fact she hadn’t been cleared for travel by the company’s doctor. The couple found themselves facing a 950K bill. Each insurer has its own definition of a “pre-exisiting condition”. It could be anything from heart surgery to pregnancy or a broken leg 10 years ago. You will most likely have to pay more for them to be covered. If you are into scuba diving or bungee jumping and something happens to you while practising these activities , chances are that you won’t be covered. Because your doctor cleared you for travel, doesn’t mean the insurer’s doctor has also cleared you for travel. For example, don’t forget to include all the names of the people who need coverage. Ultimately, it is your responsibility to understand your policy and what it covers and what it doesn’t. When in doubt, it is best to ask. Remember, insurance companies are not charities. If the insurer has an opportunity to deny your claim, it will do so! Should you ever take a pay cut?